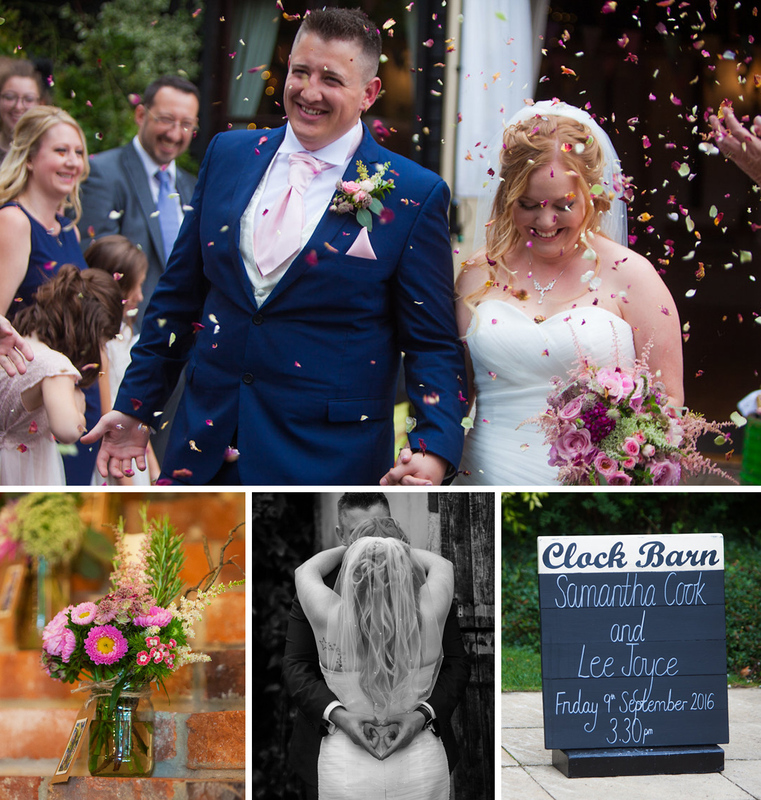 Samantha and Lee had set their hearts on a barn wedding venue in the south of England and it wasn’t long before the pair came across Clock Barn. 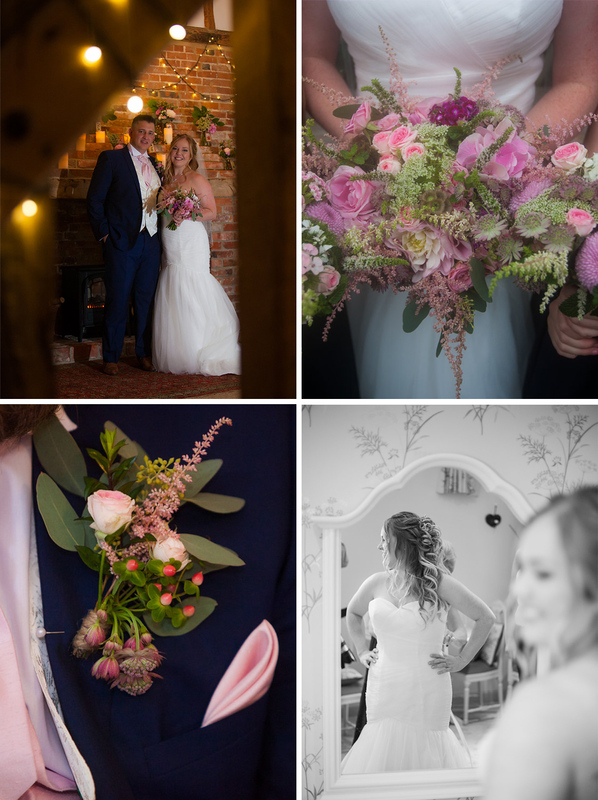 With its rustic style, welcoming and cosy atmosphere and picturesque countryside surroundings, it ticked all the boxes. Styling the Barn was easy. 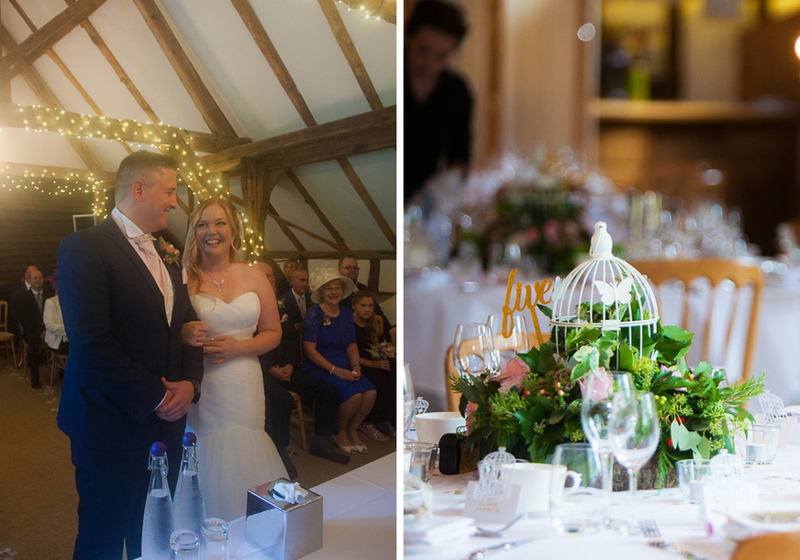 As it already featured rustic detail, including bunting, beams and fairy lights, the pair needed to add little of their own to finish off their rustic wedding theme. 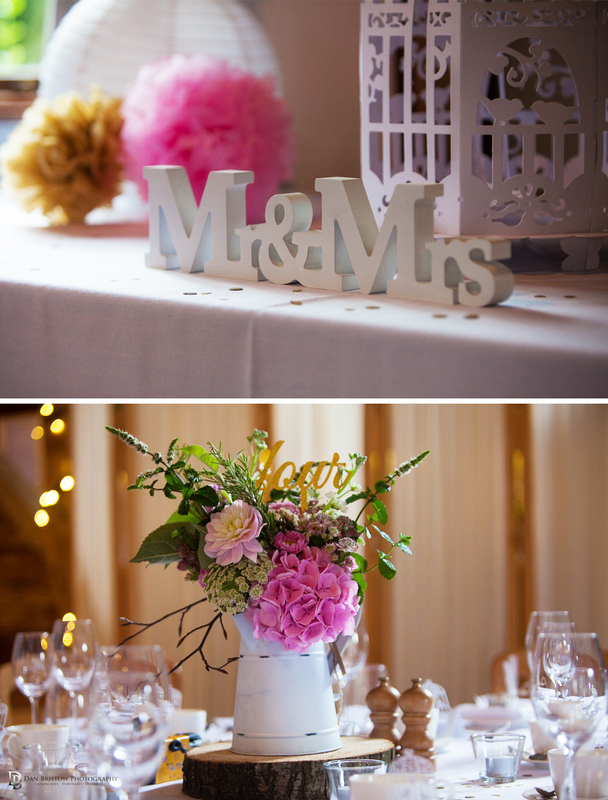 A few pom poms and a little extra bunting completed the look while wild flowers, milk jugs and birdcages adorned the wedding breakfast tables. Something else that was high on the couple’s list of priorities was a stunning wedding cake. Having seen Alexander Taylor Cakes’ creations, the pair knew they needed one for their own wedding. When it came to her wedding gown, Samantha dreamed of something that was simple and traditional. She chose a fitted trumpet-style dress made with silk satin and tulle. An ivory veil, scattered with Swarovski crystals, and a pair of sparkly shoes finished off her look. It wasn’t just Samantha who embraced a touch of glitz and glam – her two bridesmaids did too. They both wore matching navy blue gowns and silver sparkly shoes. Samantha and her bridal party took advantage of all of Clock Barn’s perks. They got ready at the venue on the morning of the wedding, ensuring a stress-free start to the day. Making her way to the aisle was easy too – the bridal prep room being just a few steps away. Once the formalities were over, the wedding party indulged in a whole host of delicious food. There were drinks and canapés post-wedding and an afternoon tea reception to follow. Come evening, the laid-back feast continued with fresh pizza devoured by all. When it came to big-day entertainment, the pair decided on a wedding photo booth and classic party tunes to dance to throughout the night. When guests weren’t amusing themselves with hilarious photo booth antics, they enjoyed the eclectic atmosphere on the dance floor – or tucked into a slice of pizza or two! “The food was lovely and the photo booth great for making special memories.” – Samantha. View the Clock Barn Gallery for more ideas and inspiration.